Arteriovenous fistulae (AVF) have advantages over arteriovenous grafts (AVG) and central venous catheters (CVC), but whether AVF are associated independently with better survival is unclear. Recent studies showing such a survival benefit did not include early access experience or account for changes in access type over time and did not include data on some important confounders. Reported here are survival rates stratified by the type of access in use up to 3 yr after initiation of hemodialysis among 616 incident patients who were enrolled in the Choices for Healthy Outcomes in Caring for ESRD (CHOICE) Study. A total of 1084 accesses (185 AVF, 296 AVG, 603 CVC) were used for a total of 1381 person-years. At initiation, 409 (66%) patients were using a CVC, 122 (20%) were using an AVG, and 85 (14%) were using an AVF. After 6 mo, 34% were using a CVC, 40% were using an AVG, and 26% were using an AVF. Annual mortality rates were 11.7% for AVF, 14.2% for AVG, and 16.1% for CVC. Adjusted relative hazards (RH) of death compared with AVF were 1.5 (95% confidence interval, 1.0 to 2.2) for CVC and 1.2 (0.8 to 1.8) for AVG. The increased hazards associated with CVC, as compared with AVF, were stronger in men (n = 334; RH = 2.0; P = 0.01) than women (n = 282; RH = 1.0 for CVC; P = 0.92). These results strongly support existing clinical practice guidelines and suggest that the use of venous catheters should be minimized to reduce the frequency of access complications and to improve patient survival, especially among male hemodialysis patients. Vascular access complications are an enormous burden in the chronic hemodialysis population. Morbidity related to vascular access is the leading cause of hospitalization among patients who receive chronic hemodialysis and is associated with an estimated cost to Medicare of nearly $1 billion annually (1,2). The Clinical Practice Guidelines for Vascular Access of the National Kidney Foundation’s Dialysis Outcomes Quality Initiative recommend use of arteriovenous (AV) accesses (native fistulae or synthetic grafts) for hemodialysis to avoid the use of a venous catheter (3). Arteriovenous accesses provide higher blood flow rates than do venous catheters (4) and are associated with lower rates of infection (5), thrombosis (6), septicemia (7), and central venous stenosis (8). The Dialysis Outcomes Quality Initiative Guidelines further recommend fistulae over grafts, as most studies have found fistulae to have fewer complications (3,9). 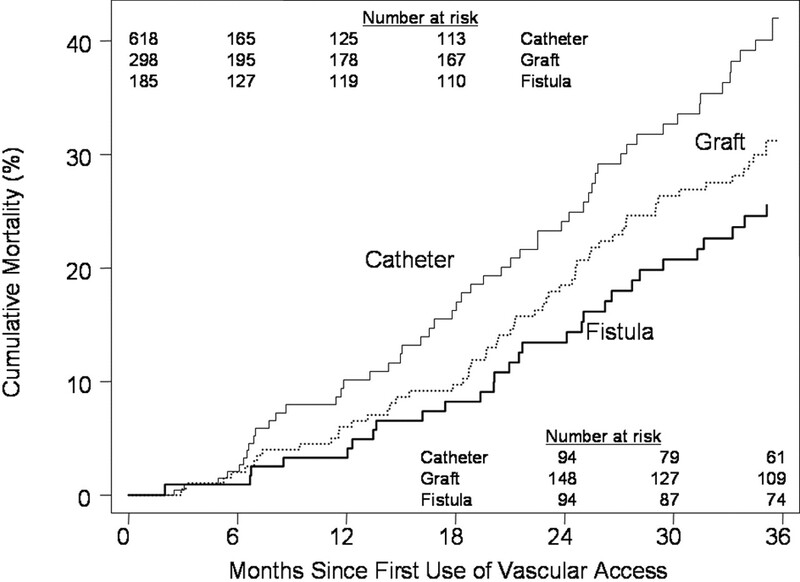 Despite these data, roughly two thirds of incident hemodialysis patients use a venous catheter at the initiation of dialysis, and fewer than 15% begin dialysis with an AV fistula (AVF) (10). The proportion of patients who use an AV access increases significantly with time on hemodialysis, but nearly one third of patients still have not received a single dialysis session with an AV access by 6 mo after initiation of hemodialysis (11). Several large studies have found a higher risk for mortality among patients with a venous catheter, compared with AV accesses, but each based the assignment of access type on a cross-sectional survey of the type of access in use at one point in time (12–15). Because of delayed AV access creation, time required for access maturation, and the frequent complications and need for new access sites, this may lead to substantial misclassification of the type of access actually in use. This would be especially problematic for studies of incident hemodialysis patients, as the distribution of access types in use changes substantially during the first 6 mo of hemodialysis (11). These studies also have not controlled for some potentially important confounding factors, such as insurance coverage and timing of first referral to a nephrologist, both of which may be strongly associated with the choice of vascular access and subsequent mortality. We previously found that patients with an AVF had a lower incidence of access complications than those with an AV graft (AVG), but this benefit was not realized in women or in men in the upper quartile of age (>72 yr) (9). The question of whether any survival benefits of AVF are similarly limited to younger patients and men has not been addressed in previous studies. To address these issues, we studied the association of access type with survival over the initial 3 yr of hemodialysis, accounting for changes in access type over time, among 616 incident patients who were enrolled in the Choices for Healthy Outcomes in Caring for ESRD (CHOICE) Study. The study participants were a subpopulation of patients who were drawn from dialysis centers that participate in the CHOICE Cohort Study (16). CHOICE is a national, prospective cohort study of incident dialysis patients initiated in 1995 to investigate treatment choices of modality and dose and outcomes of dialysis care. From October 1995 to June 1998, 1041 patients were enrolled from 79 dialysis clinics associated with Dialysis Clinic, Incorporated (Nashville, TN), New Haven CAPD (New Haven, CT), and the Hospital of St. Raphael (New Haven, CT). All patients were incident kidney failure patients who were starting outpatient dialysis, were older than 17 yr, and spoke English or Spanish. All patients provided informed consent. Patients were enrolled a median of 45 d from initiation of chronic dialysis (98% within 4 mo). The present study was limited to patients who used hemodialysis as their initial renal replacement modality (n = 762), were enrolled at clinics associated with Dialysis Clinic, Incorporated (n = 735), and had vascular access information in the records available at the time of review (n = 616). The Johns Hopkins University School of Medicine Institutional Review Board and the review boards for the clinical centers approved the protocol. Demographic characteristics and date of first chronic dialysis were ascertained from the Health Care Financing Administration Medical Evidence Form (Form 2728), which was completed at initiation of chronic dialysis. Body mass index was calculated as weight/height2 (kg/m2). Race was self-reported and categorized as African American or other. Self-reported education was categorized by whether the participant reported having completed high school. Self-reported insurance status before initiation of dialysis was categorized as Medicare/Medicaid, group, other, or none. The Index of Coexistent Disease (ICED), a measure of the severity of 19 comorbid diseases, was completed at enrollment by a trained research nurse based on medical records (17). The ICED score was categorized as mild (0 or 1), moderate (2), or severe (3). The prevalence of peripheral vascular disease (PVD) and cardiovascular disease (CVD; defined as any history of myocardial infarction, cardiac revascularization procedure, angina, or stress test positive for ischemia) were determined from review of dialysis clinic records by one of two dialysis research nurses. Mention of a condition (past or present) in the medical record was sufficient for positive coding. The time of self-reported first referral to a nephrologist relative to the initiation of chronic hemodialysis was divided into three categories (<4 mo, 4 to 12 mo, and >12 mo). Discharge summaries, dialysis flow sheets, and dialysis clinic progress notes were collected by clinic coordinators at each clinic at enrollment and annually. The type and the date of first and last use of each vascular access used was abstracted from medical records by two investigators (B.C.A. and J.A.E.). On a participant’s death, records and study forms were sent from the dialysis clinic to the data coordinating center. Vital status was verified actively every 3 mo, and passive follow-up was conducted using data from the Centers for Medicare & Medicaid Services. For individuals who left the study for reasons other than renal transplantation, vital status was passively determined using Center for Medicare and Medicaid Services data (n = 38). The characteristics of patients who were using each type of vascular access at initiation and at 6 mo after initiation of hemodialysis were compared using t test for continuous variables and χ2 tests for categorical variables. The association of access type and mortality was investigated using survival analyses, with the type of access in use treated as a time-dependent variable. These analyses included each vascular access used for at least one dialysis session. Survival time was calculated from the date of first use of the access to the date of death, a change in access, withdrawal from the study as a result of transplantation or loss to follow-up, or at November 1, 2000. Kaplan-Meier curves were developed for each access type and compared by log-rank tests (18). Multivariate Cox proportional hazards regression was used to assess the independent predictors of death (19). Robust variance estimates were used to account for the possible correlation of outcomes between separate accesses used by individual patients (20). To account for the higher risk for mortality in earlier time periods after starting dialysis, when catheters are most frequently used, the time since initiation of dialysis (<3 mo, ≥3 mo) also was entered as a time-dependent variable. To account for changes in access type as a result of complications that eventually resulted in death, analyses were repeated after including a lag of 30 d (i.e., deaths were assigned to the type of access in use 30 d before the date of death, rather than the type of access in use at the time of death). All terms were included in each of these models. The last type of access known to be in use, if known past the first year of hemodialysis, was assumed to be used thereafter. Patients with vascular access information available for <1 yr were censored at the time when vascular access information was no longer available. Analyses were repeated censoring all patients at the time when vascular access information was no longer available. Statistical analyses were performed using Stata statistical software (21). At initiation of hemodialysis, 410 (66.6%) of 616 patients were using a catheter, 121 (19.6%) were using an AVG, and 85 (13.8%) were using an AVF (Table 1). Nearly one third (30.4%) of patients were black, 25.7% had PVD, and 46.4% had CVD at initiation of hemodialysis. More than one half (54.4%) had diabetes. The 616 patients who were included in this study did not differ significantly in terms of age; race; gender; ICED score; prevalence of diabetes, CVD, or PVD; insurance status; or referral time from 119 CHOICE participants without access information. Patients who were using an AVG at the initiation of hemodialysis were older, had more severe comorbidity, and were more likely to be female and black and have diabetes than patients who were using an AVF. Patients who were using an AVG also were more likely than those who were using an AVF to have Medicare coverage and be referred late (>12 mo) to a nephrologist. Patients who were using a catheter at the initiation of hemodialysis also had more severe comorbidity and were more likely to be referred late than those who were using an AVF. Patients who were using a catheter at the initiation of hemodialysis were younger and were less likely to be female and black and have diabetes than those who were using an AVG. A total of 457 changes in vascular access were documented in the 616 patients during the study (0.63 per person-year). There were 347 changes in the first 6 mo of hemodialysis (1.29 per person-year) and 110 changes after the first 6 mo (0.24 per person-year; P < 0.001). At 6 mo after initiation of hemodialysis, 33.5% of surviving patients were using a catheter, 40.5% were using an AVG, and 26.0% were using an AVF. Higher age, black race, female gender, diabetes, more severe comorbidity, and late referral remained associated with AVG use, as compared with AVF use. Patients who were using a catheter 6 mo after initiation of hemodialysis were less likely to be female or black and to have diabetes than those who were using an AVG. A total of 1084 vascular accesses were used over 1382 person-years. The median length of follow-up for patients was 27 mo. There were a total of 195 deaths among the 616 patients followed (Table 2). Of these, 37 (19.0%) were attributed to infection, and 27 (13.8%) were attributed to septicemia. The overall mortality rate was 14.1 (95% confidence interval [CI], 12.3 to 16.2) per 100 person-years. The infection-related mortality rate was 2.7 per 100 person-years. The mortality rate per 100 person-years was lowest among AVF (11.7), intermediate among AVG (14.2), and highest among catheters (16.1). Cumulative mortality curves by access type are shown in Figure 1. AVF (P = 0.008) and AVG (P = 0.05) had lower mortality than catheters by log-rank test. The difference between AVF and AVG was NS (P = 0.33). The mortality rate (per 100 person-years) was much higher in patients age ≥65 yr than patients age <65 yr (21.0 versus 9.6; P < 0.001), in patients of races other than black (17.0 versus 8.4; P < 0.001), in patients with PVD than without PVD (20.5 versus 11.9; P < 0.001), in patients with CVD than without CVD (18.1 versus 10.7; P < 0.001), and in patients with severe comorbidity compared with moderate or mild comorbidity (20.6 versus 14.5 versus 7.2; P < 0.001). The mortality rate was much higher in patients with Medicare/Medicaid than with group health insurance (18.7 versus 8.1; P < 0.001). The mortality rate was higher with decreasing referral time (12.9 versus 15.2 versus 16.0 per 100 person-years for >12 mo, 4 to 12 mo, and <4 mo, respectively; P = 0.17 for trend), but these differences did not reach statistical significance. Mortality rates did not differ significantly by gender, diabetes, smoking status, or education. Kaplan-Meier cumulative mortality curve, by type of vascular access in use among 616 participants in the Choices for Healthy Outcomes in Caring for End-Stage Renal Disease (CHOICE) Study. Mortality rates stratified by access type and gender are shown in Figure 2A. Men who were using a catheter had a higher risk for death per 100 person-years than did men who were using an AVF (18.8 versus 10.2; P = 0.01). The risk among men who were using a graft (14.5 per 100 person-years) did not differ significantly from those who were using an AVF (P = 0.17) or those who were using a catheter (P = 0.25). Among women, risk for death did not differ by access type (per 100 person-years: 13.3 for catheters, 14.0 for AVG, and 15.2 for AVF; all P > 0.66). Mortality rates stratified by access type and age are shown in Figure 2B. Patients who were younger than 65 yr and using a catheter had a higher risk for death per 100 person-years than did their counterparts who were using an AVF (12.3 versus 8.2; P = 0.14) or an AVG (8.7; P = 0.18), although neither difference reached statistical significance. Among patients who were 65 yr and older, risk for death did not differ by access type (per 100 person-years: 21.8 for catheters, 21.7 for AVG, and 19.2 for AVF; all P > 0.63). Annual mortality rates (95% confidence intervals) by type of vascular access in use and gender (A) and age (B) among 616 participants in the CHOICE Study. *P < 0.02 versus fistula. In an unadjusted Cox proportional hazards regression model, catheter use was associated with a relative hazard (RH) of 1.67 (95% CI, 1.14 to 2.45) compared with use of an AVF. Use of an AVG was associated with an unadjusted RH of 1.22 (95% CI, 0.84 to 1.79). The RH associated with catheter use (1.75; 95% CI, 0.78 to 3.94) and AVG use (RH = 1.13; 95% CI, 0.50 to 2.57) were similar when patients were censored at the date of last vascular access information (n = 42 deaths). Catheter use was associated with a 39% higher risk for infection-related death than AVF use (RH = 1.39; 95% CI, 0.61 to 3.14). AVG use was associated with an RH of 0.84 (95% CI, 0.37 to 1.94) for infection-related death. Catheter use remained associated with higher mortality after adjustment for age, gender, race, history of PVD, history of CVD, presence of diabetes, index of coexistent disease, body mass index, smoking status, and education. Further adjustment for timing of first referral to a nephrologist and insurance status at initiation of dialysis slightly attenuated the association (RH = 1.47; 95% CI, 1.01 to 2.17; Table 3). Patients with an AVG were at 21% higher risk for death than those with an AVF (RH = 1.21; 95% CI, 0.82 to 1.78), although this did not reach statistical significance (P = 0.33). The higher risk for mortality associated with use of a catheter or an AVG, compared with an AVF, remained unchanged when a lag of 30 d was included. The increased risk associated with catheter use after adjustment was higher among men (RH = 1.98; 95% CI, 1.16 to 3.38) than among women (RH = 0.96; 95% CI, 0.50 to 1.87; P < 0.05 for interaction). There was no significant difference in mortality risk associated with catheter use in patients who were younger than 65 yr compared with older patients (P = 0.50 interaction). The risk for mortality associated with catheter use did not differ significantly by race, presence of PVD, presence of CVD, or presence of diabetes (all P ≥ 0.33 for interaction). We found that among patients in a nationwide study with systematic follow-up, participants who were using a catheter for hemodialysis vascular access were at approximately 50% higher risk for mortality compared with those who were using an AVF. This association remained after adjustment for many potential confounders, including predialysis insurance status and timing of nephrology referral, and after accounting for changes in access type over time. Patients who were using an AVG were at 21% higher risk for death than those who were using an AVF, although this did not reach statistical significance. The increased risk for death associated with catheter use seemed to be more pronounced among men than women but was consistent across other subgroups. This is one of the first studies of the association of vascular access type and mortality to account for changes over time in the type of access used. We observed a substantial difference in the distribution of access types in use during the first 6 mo of hemodialysis, suggesting that studies that assign the type of access at one point in time may be susceptible to a large amount of misclassification. We captured 457 changes in vascular access during follow-up, but these changes were much more likely to occur in the first 6 mo after initiating dialysis than after a longer duration. These results suggest that studies in prevalent hemodialysis patients (>6 mo after initiation of dialysis) may provide more reliable data on the association of vascular access type and subsequent mortality than similar studies of incident hemodialysis patients. Importantly, however, early deaths would be missed in any study of prevalent hemodialysis patients. Nonetheless, our results generally agree with those obtained from previous studies that used cross-sectional data to assign the type of access in use. Among incident patients ≥67 yr in the United States Renal Data System from 1995 to 1997, Xue et al. (14) found a 70% higher risk for 1-yr mortality for patients who initially were using a catheter and a 16% higher risk for those who initially were using an AVG, as compared with an AVF. The classification of initial access type in that study, however, was based on Medicare procedure codes for insertion of a catheter or placement of a permanent access for hemodialysis, and it is unknown how long any accesses that were placed were used, if ever. That study was not able to adjust for some potentially important confounders, such as timing of nephrology referral, which has been found to be strongly associated with both the type of vascular access in use and the risk for subsequent mortality among hemodialysis patients (11,22). Pastan et al. (13) found somewhat less elevated risks associated with catheters (RH = 1.4) and grafts (RH = 1.1) among prevalent hemodialysis patients who were ≥67 yr in ESRD Network 6. Patients who were included in that study had been receiving dialysis for a mean of 4.3 yr when the vascular access type in use was abstracted, and fewer than 15% were using a catheter for hemodialysis. Among participants in wave 1 of the Dialysis Morbidity and Mortality Study, Dhingra et al. (12) reported increased risks of 54% among diabetic and 70% among nondiabetic patients who were using a catheter and 41% among diabetic and 8% among nondiabetic patients who were using an AVG, compared with their counterparts who were using an AVF. Polkinghorne et al. (15) recently applied a propensity score analysis to an incident hemodialysis cohort (Australian and New Zealand Dialysis and Transplant Association [ANZDATA]) and found more than a twofold increase in the risk for death among patients who were using a catheter, as compared with an AVF. Use of an AVG was associated with 55% higher risk for death compared with use of an AVF. The distribution of access types in that cohort, however, differs substantially from the current study and from US nationwide data (23). Whereas 60% of the incident patients in the ANZDATA cohort used an AVF at the initiation of hemodialysis and only 30% used a catheter, fewer than 14% of patients who were enrolled in the CHOICE study used an AVF at initiation of hemodialysis and more than two thirds used a catheter. AVG use was also much lower in the ANZDATA cohort (10%) than the CHOICE cohort (40% at 6 mo after initiation of hemodialysis). The CHOICE study population is largely similar to the U.S. hemodialysis population, although significant differences in the distribution of comorbid conditions may exist between our study population and hemodialysis populations in other countries (24). This observational study cannot directly address the mechanisms by which venous catheters may be related to a higher risk for mortality. Several potential mechanisms, however, have been proposed. Catheters provide a lower blood flow rate; therefore, a lower dialysis dose may be achieved (4). The increased rate of access-related complications may result in more missed or shortened dialysis sessions (6). This again may lead to a lower dialysis dose, more frequent hospital admissions, and other untoward effects (2). The higher risk for mortality in patients with a venous catheter also may be a direct result of access infections and septicemia, which are much more common in catheters than AV accesses (7,25). The current study found a 41% higher risk for infection-related death in patients who were using a catheter as compared with those who were using an AVF, but this estimate was based on only 37 deaths classified as being attributable to infection. The potential for residual confounding, as a result of unmeasured factors that predispose patients to both use of a venous catheter and a higher risk for death, cannot be overlooked. We did not have data on access evaluation procedures or vascular anatomy before access placement. Practices between clinics vary considerably, and these differences may have introduced some confounding if those clinics that have AVF placed in a higher proportion of patients also have other practices that improve patient survival. No single clinic in this study, however, enrolled >8% of the total study population. We adjusted for several potentially important confounders, including the timing of first referral to a nephrologist and predialysis insurance status. The timing of nephrology referral has a strong impact on the type of vascular access used early in hemodialysis and is associated with the subsequent risk for mortality (11,22). Both earlier referral and better insurance coverage may indicate better care and overall preparation for dialysis. We found that catheter use, as compared with AVF use, imparted a greater risk in men than in women. The patterns were similar for AVG. No significant difference in the association of catheter use and mortality was observed between younger and older patients. We previously reported that men and younger patients received more benefit from AVF, as compared with AVG, in terms of the frequency of access complications than did women and older patients (9). Higher age and female gender both are independently associated with the use of an AVG rather than AVF at the start of hemodialysis (10,11). The reasons for differing effects by gender of AVF compared with catheters are speculative. Dialysis flow rates achieved by AVF in men may provide a greater benefit over catheters compared with the benefit achieved in women. Catheter-related infections and other complications may be more common or severe in men, and men, therefore, may derive a greater benefit from using an AVF. These estimates should be interpreted with caution, however, as they are based on relatively few deaths in some strata (e.g., 17 deaths among women using an AVF). In this nationwide study, incident hemodialysis patients who were using a venous catheter were at a 47% higher risk for death compared with their counterparts who were using an AVF. Patients who were using an AVG were at intermediate risk. This association remained after adjustment for potential confounding factors and after accounting for frequent changes in access type over time. The risk associated with catheter use was significantly higher in men than in women. These results add to the existing data suggesting that the use of venous catheters should be minimized to reduce the frequency of access complications and to improve patient survival. The CHOICE Study is supported by R01DK59616 from the National Institute of Diabetes and Digestive and Kidney Diseases; R01HS08365 from the Agency for Healthcare Research and Quality; and R01HL62985 from the National Heart, Lung, and Blood Institute. B.C.A. was supported by T32HL07024-23 from the National Heart, Lung, and Blood Institute. J.A.E. was supported by a Johns Hopkins University Clinical Scientist Career Development Award. M.J.K. was supported by T32DK07732 and K24DK02856, N.R.P. by K24DK02643, and J.C. by R29DK48362 from the National Institute of Diabetes and Digestive and Kidney Diseases. This work was presented in abstract form at the 36th annual meeting of the American Society of Nephrology, San Diego, CA, November 2003. CHOICE is a Patient Outcomes Research Team studying dialysis care for ESRD. The CHOICE investigators include Drs. Neil R. Powe, John H. Sadler, Michael J. Klag, Gerard F. Anderson, Brad C. Astor, Eric B. Bass, Ronald Brookmeyer, Josef Coresh, Dana Miskulin, Nancy E. Fink, J. Craig Longenecker, Klemens Meyer, Andrew Levey, Nathan Levin, Haya R. Rubin, and Albert W. Wu. We thank the patients, staff, and medical directors of the participating clinics at Dialysis Clinic, Incorporated, who contributed to this study.